Wanna tell us something? Make more friends- Send an eCard! Yes folks, come on in! You're never too young or too old to get a haircut at this shop. You're just 1 year old? Still no hair growing on your head? No problem, we'll still cut whatever amount of hair you have. If not, we'll find some hair in your body to cut. Yes, folks, this shop is for everyone! You're over the hill? More than 100 years old? I said: "MORE THAN 100 YEARS OLD?!!" Little hard of hearing? Can barely eat or talk, much less care what you look like? And maybe your hair no longer grows back after cutting? No problem, we'll handle your hair for you. Even if we don't cut anything, you're too old to notice and you'll pay up like the rest of the other people! So what are you waiting for? Come one, come all to the shop that caters to patrons from all ages from 1 year to 100 years! 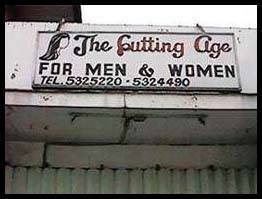 Come to the Cutting Age!